A Greek Cup semi-final had to be called off after PAOK fans threw flares and clashed with riot police during the first leg of their tie with Olympiakos. 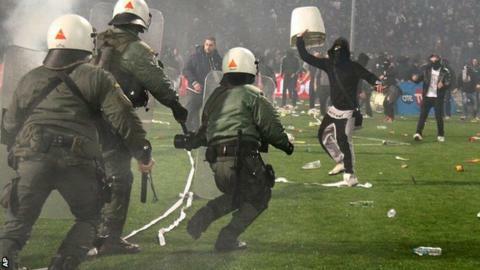 Violence broke out when hosts PAOK were denied a late penalty with the visitors leading 2-1. Police fired tear gas to disperse fans on the pitch and the match was called off in the 90th minute. Olympiakos will now be awarded an automatic 3-0 victory to carry into the second leg on 6 April. PAOK had taken the lead through Robert Mak but Olympiakos scored with goals from David Fuster and Esteban Cambiasso.